The official biography of Margaret Thatcher has revealed that one of her closest advisers, Sir John Hoskyns, thought she 'broke every rule of good management'. As revelations about the Thatcher years are drip fed to the media to rev-up sales of Charles Moore’s biography it is becoming clear that she was as powerfully divisive in the meeting rooms of Downing Street as she was to Britain as a whole. The latest nugget of drama to be revealed is a memo from adviser John Hoskyns to Thatcher just two years into her premiership, analysing her management style and predicting many of the reasons why she would eventually be kicked out of office. 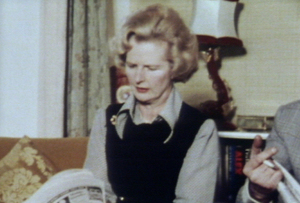 The memo was written amid cabinet feuds between the monetarist budget in 1981 and the autumn statement of the same year. It said: ‘You break every rule of good man-management. You bully your weaker colleagues. You criticise colleagues in front of each other and in front of their officials. Apparently Thatcher simply ‘hissed’ at the memo, saying that nobody had written to her with such hostility whilst she was prime minister. It was for this reason that Hoskyns recollected ‘the seeds of her downfall were being sown’.